Description: Yellowish-brown seeds with a distinctive aroma and warm taste. Usage: Mix with ground chiles to season chilis, fajita vegetables and meats. Blend into Indian masalas and curries. Add to dry meat rubs and marinades. 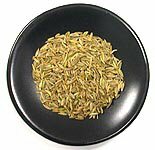 Cumin is most commonly used in chili powder, Indian curries, and Middle Eastern foods. It has a warm, earthy flavor. It can be purchased in ground or seed form. Whole seeds will stay fresh longer than ground.